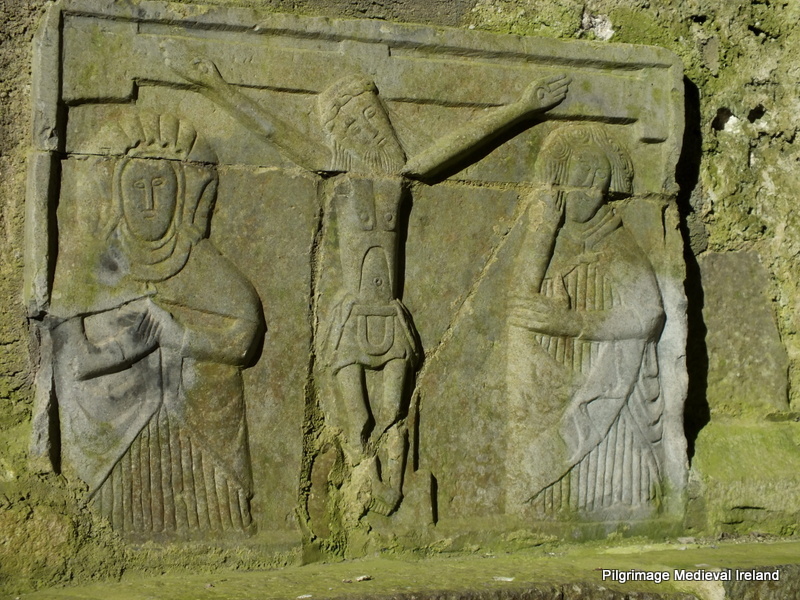 To mark Easter I have decided to share some photos of the carvings of the Crucifixion & Resurrection of Christ found on Irish Sculpture dating to the Early and Late Medieval period. This imagery was popular in medieval times, for Christian believers, ‘Christ’s suffering and death brought the promise of redemption a theme emphasised by the crucifixion’ (Stalley 1996, 16). 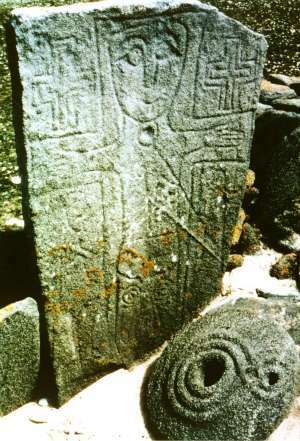 One of the earliest representations of the Crucifixion is found on a 9th/10th century cross slab on the island of Inishkea North, off the coast of County Mayo. 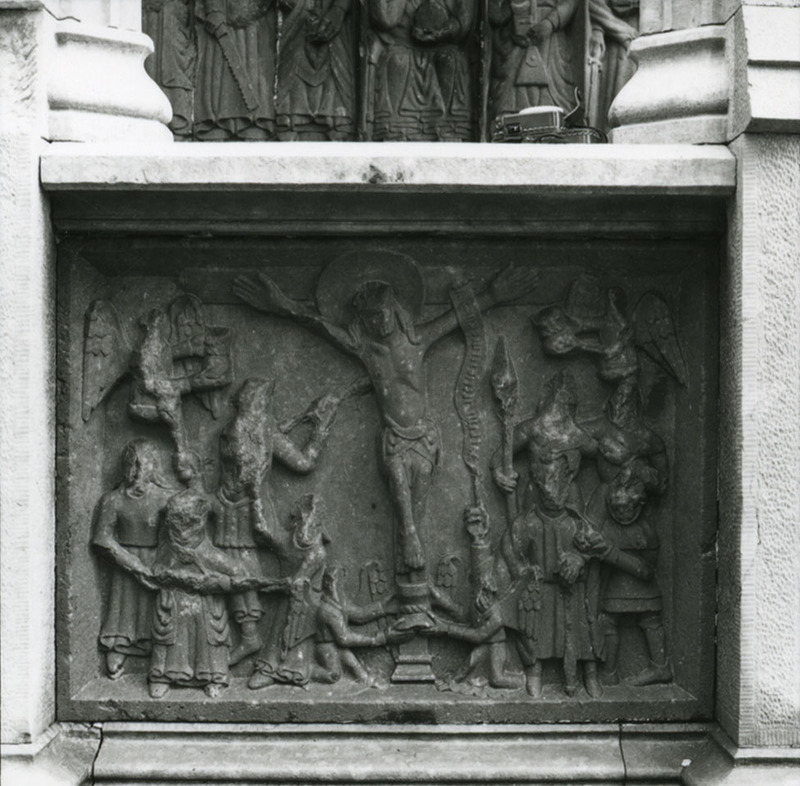 The slab depicts the figure of a triumphant Christ nailed to the cross, with a wide smiling on his face. 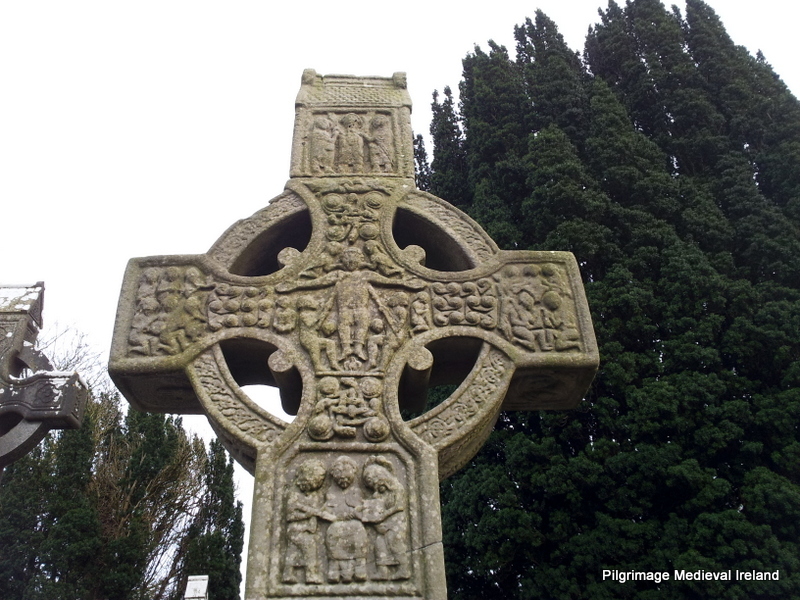 Many early medieval High Crosses incorporate scenes of the Crucifixion, usually located at the centre of the cross as at the Durrow High Cross in Co Offaly. The majority depict two soldiers, Stephaton and Longinus, on either side of the Christ figure, one offering vinegar to the dying Christ, the other piercing his side with a lance. 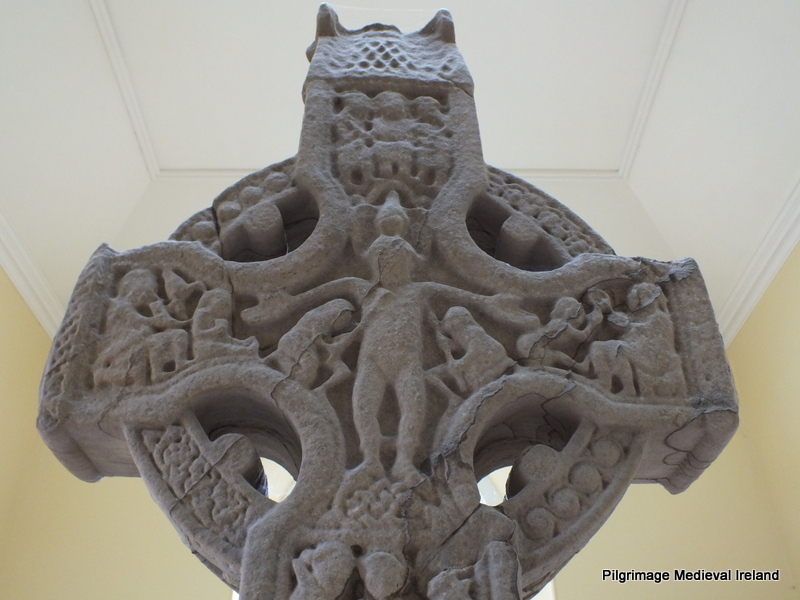 Crucifixion scene on the Durrow High Cross. Or Muiredach’s High Cross Monasterboise, Co Louth, created in the 9th/10th century. On both crosses the lance-bearer and sponge-bearer are placed on either side of Christ. 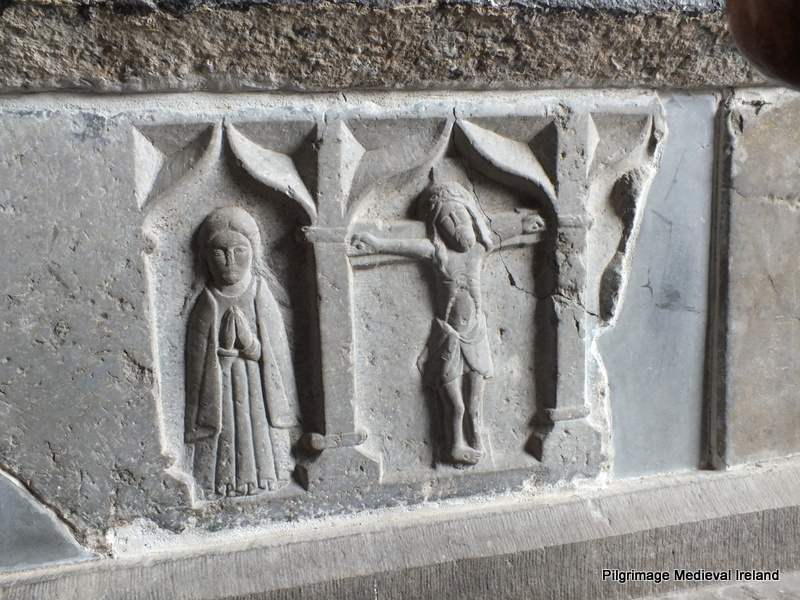 The crucifixion scene on the Monasterboise High Cross, Co Louth. 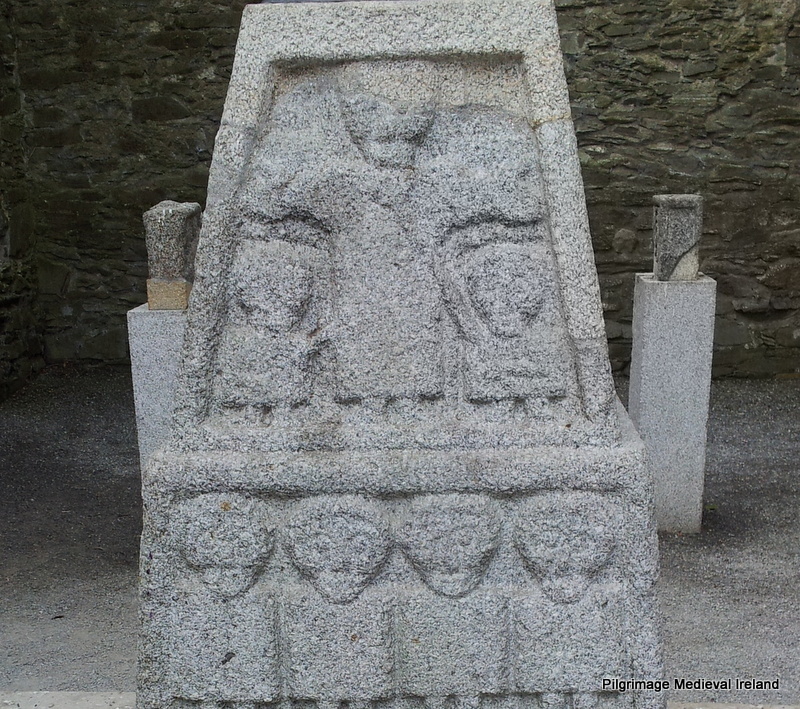 The Crucifixion is also found on the shaft of the 8th century Moone High Cross, Co Kildare. The Christ figure is dressed in a long robe. 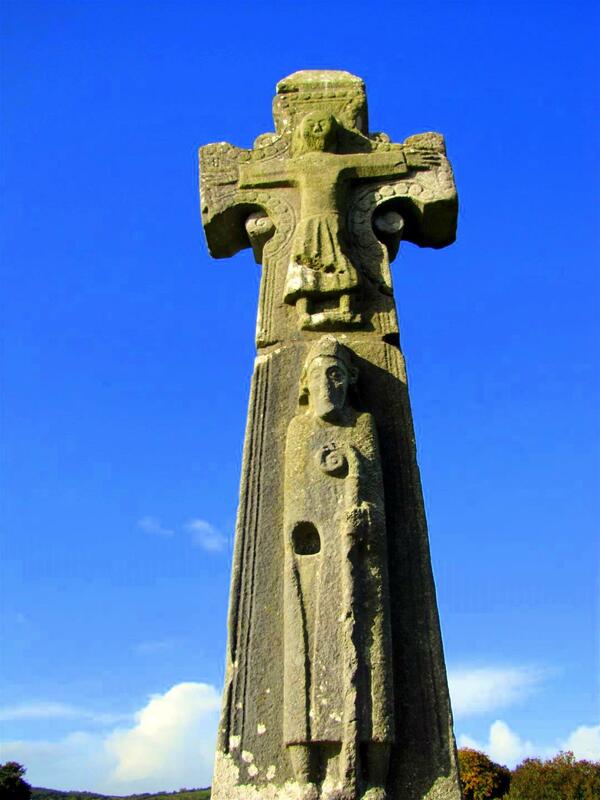 Crucifixion scene on the Moone High Cross Co Kildare. 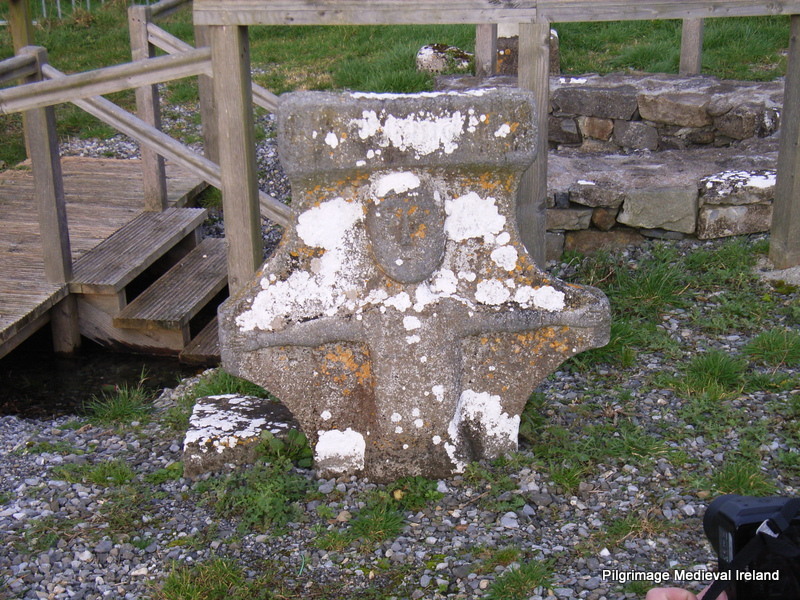 Below is the Dysert O’Dea High Cross from Co Clare. It dates to the twelfth century and belongs to the later Romanesque series of crosses dominated by high relief figures of the crucifixion and bishops or patrons. Christ is depicted in a robe with a pleated skirt with his hands out stretched. One of my favourite crosses dates to the late medieval period and is found at St Ciaran’s holy well at Clonmacnoise Co Offaly. It has a simple figure of Christ and the inscription over head reading ‘Repent and do penance’. It is part of the modern pilgrim stations at the holy well. 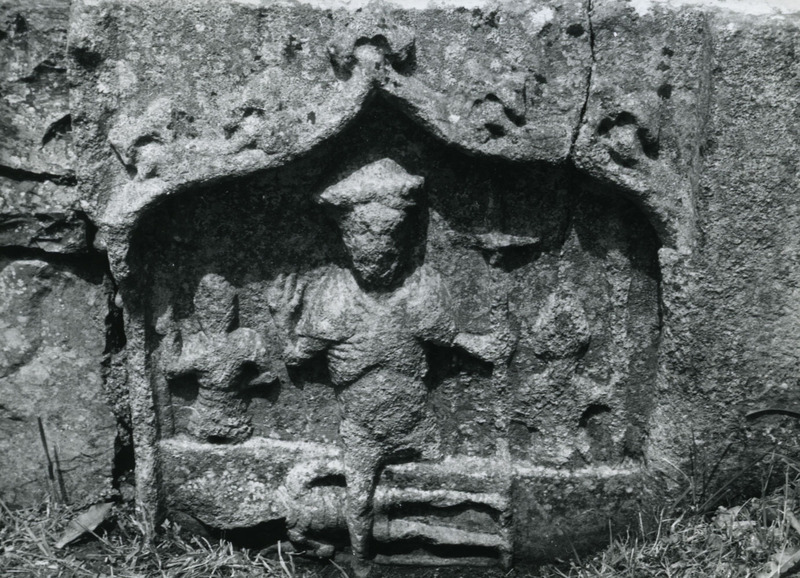 In late medieval Ireland the Crucifixion often appears on funerary monuments such as chest tombs. A fine example is found as part of the Creagh Tomb at Ennis Friary. The Creagh Tomb was built in 1843 but it incorporates parts of earlier medieval tombs from the Friary. The Office of Public Works are carrying out conservation work on the Creagh Tomb and part of the Friary. The panels are currently on display at Ennis Friary which is open to the public. I highly recommend a visit to the Friary which is full of many interesting features. 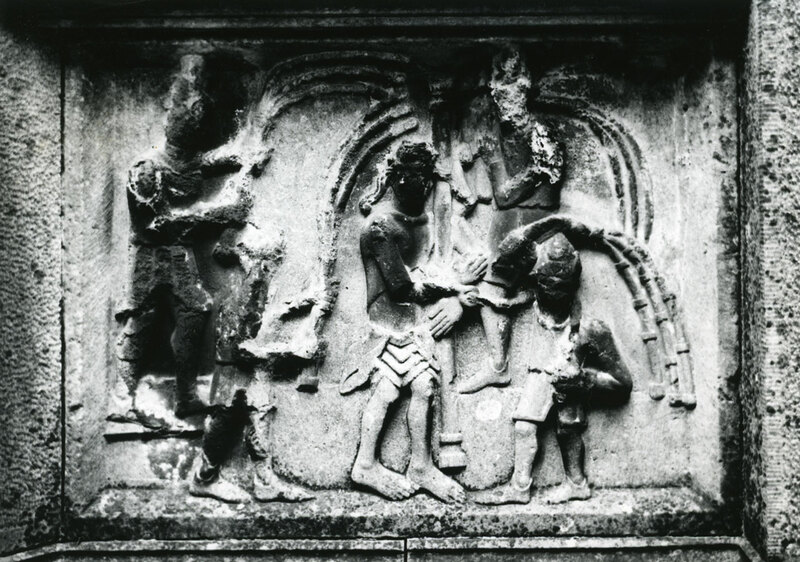 The bottom of the monument incorporates the ‘passion panels’ from the McMahon tomb and depictions of Christ and twelve apostles taken from another royal tomb. The Betrayal of Christ- the panel depicts the figure of an archbishop alongside a scene depicting the betrayal of Christ. Judas can be seen in the centre of the panel betraying Christ with a kiss. Peter stands on the left sheathing sword. Malchus, a Roman soldier, is on the ground below him holding his left ear with his right hand. According to the Gospels Peter attempted to prevent Christ’s arrest by attacking one of the soldiers and cutting off his ear with a sword. Christ miraculously restored the soldiers ear and condemned the action saying: “All who take the sword will perish by the sword”. The Flagellation of Christ – Pontius Pilate, the Roman governor of Judea, ordered scourging of Christ before crucifixion. In this depiction, Christ embraces a column with his hands bound. 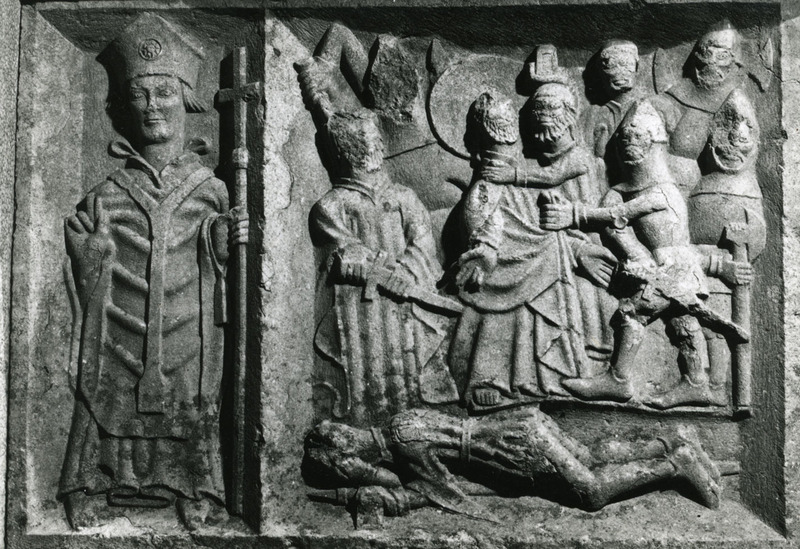 There are four executioners, two on either side of the central figure. Each hold scourges of three knotted lashes. The Crucifixion the panel shows Christ in the center on a cross surrounded on either side and at the foot of the cross by a host of angels. Roman soldiers appear to the left and right of the panel. The soldier Longinus on the left is piercing Christs side with a spear. At the base of the cross four figures the Blessed Virgin, St John, Mary Magdalene and another male figure. Two angels hold chalices under the hands of Christ and two more kneel at the base of the cross. The Entombment of Christ – on the evening of the Crucifixion, Joseph of Arimathea asked Pilate for Christ’s body wrapped it in a linen cloth and laid it in a tomb. Some Christian traditions hold that Joseph was Jesus’ uncle – but the gospel of Mark, states that Joseph was not a follower of Jesus, but a pious Jew who wished to ensure that the body was buried in accordance with Jewish law, according to which bodies could not be left exposed overnight. 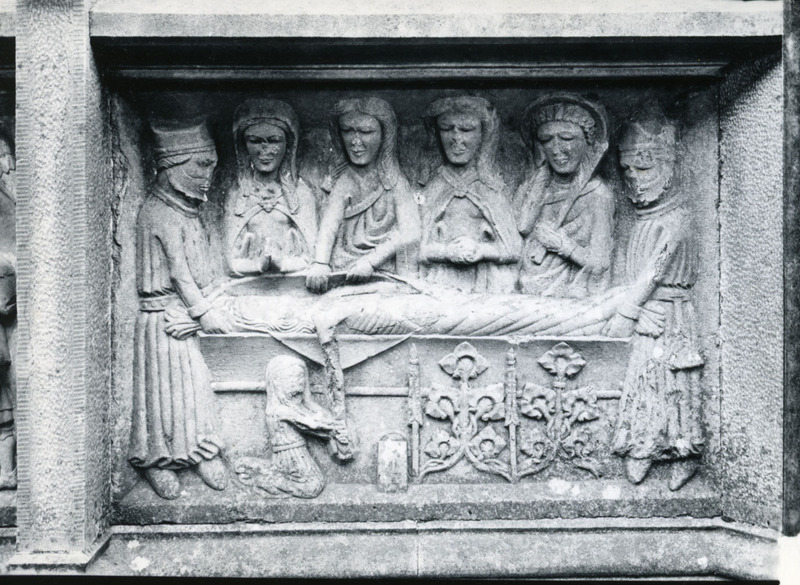 The figure on the left overseeing the entombment is thought to represent Joseph of Aramathea and the tiny figure kneeling holding Christs hand is thought to represent Mary Magdelene. The Resurrection of Christ – Christ is depicted emerging from the tomb stepping on a sleeping solider. His right hand is held aloft in blessing and in his left hand he holds a cross which has a banner affixed. The Roman soldiers are dressed in medieval armor. Another very interesting depiction of the Resurrection of Christ is found on a 16th century tomb at St. James Church, Athboy, County Meath. Christ is shown stepping from the tomb on to a sleeping soldier. Two soldiers stand within the tomb on either side of the Christ. The Christ figure holds a cross in his left hand and his right hand is raised in blessing. A 16th century example of the Crucifixion is found in the North wall of South Chapel of the North Transept of the Cathedral Church at the Rock of Cashel Co Tipperary. Christ with a sorrowful expression is shown nailed to the cross wearing a crown of thorn. Mary stands with clasped hands on the left hand-side of the cross. She is dressed in a pleated dress with an Irish style mantle known as a brat pulled up over her head. St John stands on the right hand side of the cross. He is also wearing pleated garment and mantle, his right hand is raised to his face in a gesture of sorrow. Crucifixion plaque found at the Rock of Cashel. In the North side of the chancel of Holy Cross Abbey in Co Tipperary, an end slab of a chest tomb is built into the wall under the existing mensa. The scene depicts Christ flanked on either side by St John and Mary within ogee-headed niches. St John has been broken off the panel. Mary stands with her hands joined in prayer with her hair loose over her shoulders. Have a very Happy Easter everyone. Hunt, J. Irish Medieval Figure Sculpture. Vol.1. Dublin: Irish University Press. Stalley, R. 1996. Irish High Crosses. Dublin: County House. Ennis Friary Facebook page and information boards. This entry was posted in Uncategorized and tagged Crucifixion in medieval Irish Sculpture. Lovely post. Must get to that Creagh tomb!